Tour richly furnished royal apartments. See the changing of the guard. Visit the hall where Nobel Prizes are awarded. 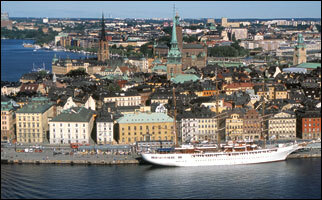 Climb City Hall's tower for a bird's eye view of Stockholm. The 70-meter (230-foot) long Vasa warship was adorned with elaborately carved sculptures, making it the pride of the sea. It was launched in 1628 with great fanfare. Within minutes, it sank and lay forgotten. In the 20th century, the Vasa was discovered, raised, restored, and placed in a custom exhibition building that allows you to see multi-level interiors. This recreated village illustrates traditional Swedish life of bygone centuries with historic buildings and costumed craft demonstrators. It exhibits artistic works from Medieval to modern times. Artists include Goya, Rembrandt, Renoir, and Rubens. Masters like Dali, Matisse and Picasso are represented.